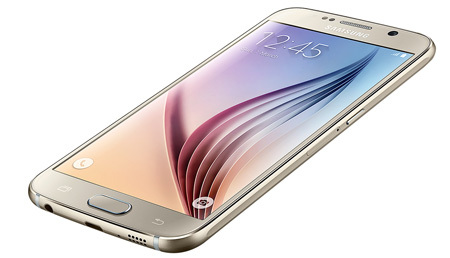 Samsung The Galaxy S6 is the latest flagship of Samsung, the Korean electronics giant. Sporting a grand and vibrant gold color, this smartphone surely has the looks to impress. With its 5.1inch Super AMOLED capacitive touchscreen, this phone enables you to view content with exquisite clarity. 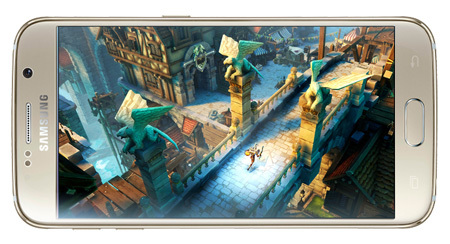 The S6 runs on an Octa Core processor that provides excellent performance. This smartphone is equipped with the Android Lollipop operating system that offers an easy to use interface with new features and widgets that you can use to give your home and lock screen a new and refined look. The phone also offers a broad range of multimedia features to keep you entertained while you're stuck in traffic or bored. The 16MP primary and 5MP secondary cameras are truly one of the most fascinating features of this device, as they let you capture pictures and record videos with crystal clarity even in conditions that are not ideal for photography. Featuring an internal storage space of 32GB, the phone is roomy enough to store a vast amount of work related files, along with apps, games, and music. You can browse the Internet on this device at blistering speeds, as it is 4G LTE, 3G, and WiFi enabled. The body of the Samsung Galaxy S6 is a combination of two contrasting materials: glass and metal. Glass reflects light and oozes sophistication, and matte aluminum adds durability and sleekness to the design. This result in a unique form factor that retains the individual characteristics of the materials while simultaneously delivering a sense of balance. 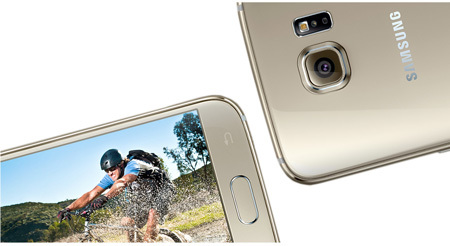 The glass on the S6 creates unique effects and depth definition as it reflects light. This dynamism is created by new CMF solution that is applied to the back of the smartphone. The phone is crafted with the specially thermoformed 2.5D Corning Gorilla Glass 4 on the front and back that provides smooth curves and enhances grip. It adds a sense of refinement to the design and provides a better feeling when you hold the phone in your hands. The Samsung Galaxy S6 delivers vivid and bright images in almost any lighting condition with its huge 5.1inch Super AMOLED capacitive touchscreen that is protected by Corning Gorilla Glass 4. Its high brightness mode is perfect for bright sunlight environment and enhances outdoor visibility. The screen also provides you with a high pixel density of up to 577ppi, so that you get the ultimate viewing experience. The Galaxy S6 lets you experience a whole new level of smooth performance with its 64 bit Octa Core processor. It facilitates high speed operations while improving power efficiency. The 3GB RAM adds to the abilities of the processor and offers excellent multitasking speeds without any glitches or lag. This Samsung smartphone is equipped with the Android Lollipop OS that offers a refined and versatile interface. It gives the interface a completely new look and feel, effects and animation, along with a new set of icons. The OS places all the essential features within easy reach and provides apps, tools, widgets and much more to enhance you user experience. 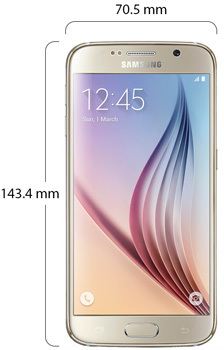 The Samsung Galaxy S6 features a 16MP primary camera that lets you capture pictures with excellent clarity. It enables you to snap images with a maximum resolution of up to 2988 x 5312 pixels. The F1.9 aperture of the lens helps provide twice the brightness in low light conditions, whereas the AF functionality lets you capture sharp photos of moving subjects. In addition, the camera comes with exciting features like geotagging, face detection, touch focus, HDR and much more. This smartphone also lets you record videos with excellent clarity and without any blur. Adding to the fun is the 5MP secondary camera that lets you snap selfies, as well as conduct video calls with ease. Time is valuable, and to maximize the available time the Samsung Galaxy S6 incorporates fast charging technology. The 2550mAh lithium ion battery requires just 10 minutes of charging for you to use the phone for up to 4 hours. 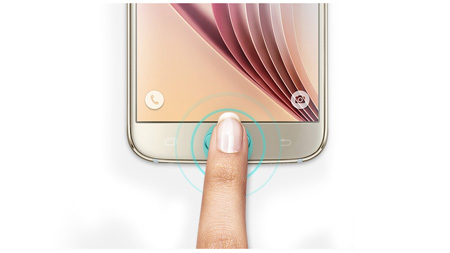 To achieve a fully charged battery, the Galaxy S6 requires just 80 minutes! 147 King Abdullah II St.